Tik-tak, Click-clack, Bump-thump and million of other noises your mechanical keyboard can make. For some a feature and others a nuisance. They would keep their distance or tell you to throw it away, but Stop! there are ways to dampen your mechanical keyboard noises. It’s not uncommon for people that are convinced to buy a mechanical keyboard and narrowed down the mechanical switch to underestimate the noise it can make… for others. Once you start typing, it sounds like music in your ears, a perfect rhythm of up following keystrokes magically creating text in front of you, but to others, it might sound as inconsistent, nerve wrecking and unending clacks. Similar to somebody playing League of Legends next to you, mouse clicking like there is no tomorrow. Mechanical keyboards are best known for their (extremely satisfying) click-clack sound and it’s considered part of the experience, but in a public environment, not everybody will be too happy about it.Especially if you use a mechanical keyboard with Cherry MX blue switches, those are literally engineered to make noise. So other than apologizing, what can you do about it? There are different methods to dampen the sound, but first you need some keyboard knowledge to understand what’s actually producing that sound. Cherry MX red switch – linear without tactile or audible feedback. 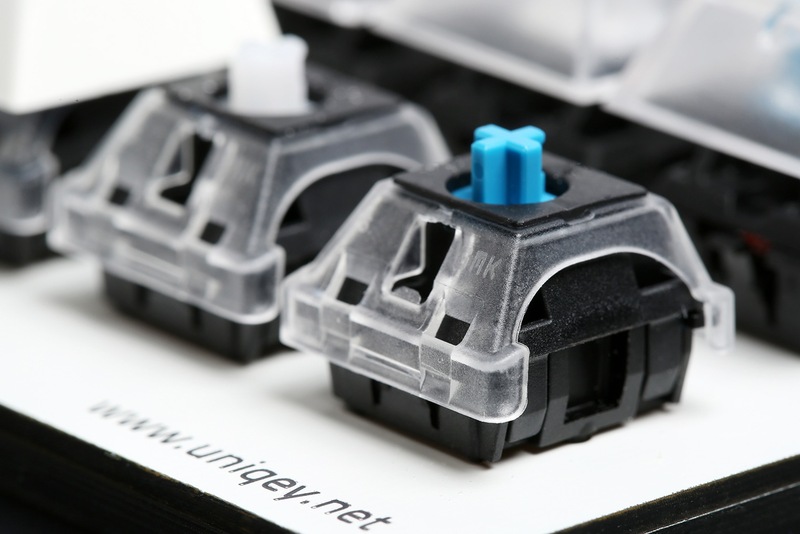 Let’s take the most popular switch brand on the market, Cherry MX switches, as an example. You know, that mechanism that defines mechanical keyboards. When you press the key all the way down, also known as bottom-out, the keycap stem will hit the switch box. This produces the infamous and most noisy “clack” sound. 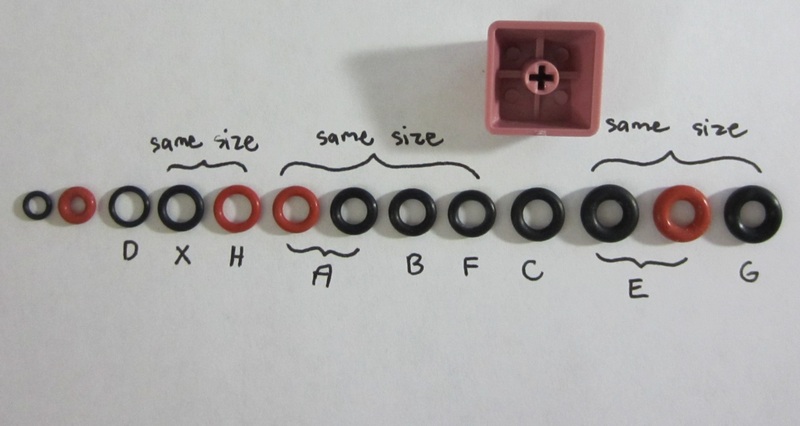 However, when you use Cherry MX blue switches there is another sound produced by the switch itself. Cherry MX blue switch – tactile and audible feedback. There is a small mechanism inside this particular switch that will produce an amplified “click sound. Furthermore, if you use particular thick keycaps, such as ABS double-shot or PBT keycaps, it will alter the sound produced. That leaves one last factor that can influence the sound of your keyboard, PCB or plate mounted switches. The plate mounted holds the switch firmly in its place, while PCB mounted will flex a bit and thereby reducing the sound vibrations. We could go further into this and how the build quality of a keyboard can further influence the sound, but heck that would get too boring! So, now that we know all this, what does it mean? Well, that “clack” sound I mentioned earlier, you can dampen that sound with o-rings, soft pads or just, well, not bottom-out. O-O-O-rings, are those lovely rubber rings that your dental orthopedist gives when you’re walking around with metal in your mouth. Actually, that’s exactly what you’ll be using here, a small thick rubber ring that you can slide underneath the keycap on its stem. Source: Geekhack, by WhiteFireDragon. O-rings ordered by size. The most common type of o-ring is the 40A-L, 40A-R and 50A-L. The numeric stands for the hardness of the rubber on the shore durometer (follow by letter) A scale. The last letter represents the thickness of the O-ring. R being twice the thickness of L. Mind blowing right? OK, here comes the interesting part. The O-ring will catch the blow between the keycap stem and switch, changing the “clack” sound into a less audible “thud” sound, but, yes, but, here comes the catch, the o-ring will also shorten the travel distance to bottom-out. That’s where the thickness plays a role. It doesn’t influence the sound but shortens the travel distance. According to different sources, L will shorten the distance by 0.2mm and R by 0.4mm but I believe this is probably inaccurate, as many people feel that R bottoms-out half way actuation and L shortly after, which is strange considering bottom-out is at 4mm and actuation at 2mm. OK! Take a breather… It’s a lot of detailed nerd information to take in, and yes we’re still talking about keyboards. WASD keyboards made a great sample video using all the different switches with O-rings. If none of those o-rings can satisfy you, then you can also make them yourself. If you’re on it anyway, you might as well use a DIY keycap puller as well. You can imagine that installing o-rings is quite tedious. So a less popular alternative are soft(landing) pads, basically a piece a foam cloth you can place on the switch itself. Source: Geekhack, user Reaper. 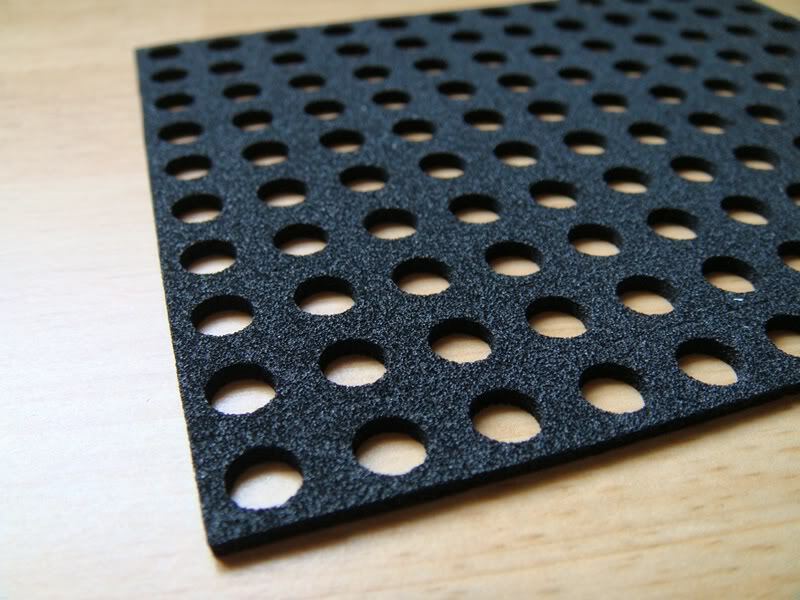 Black soft landing pads. 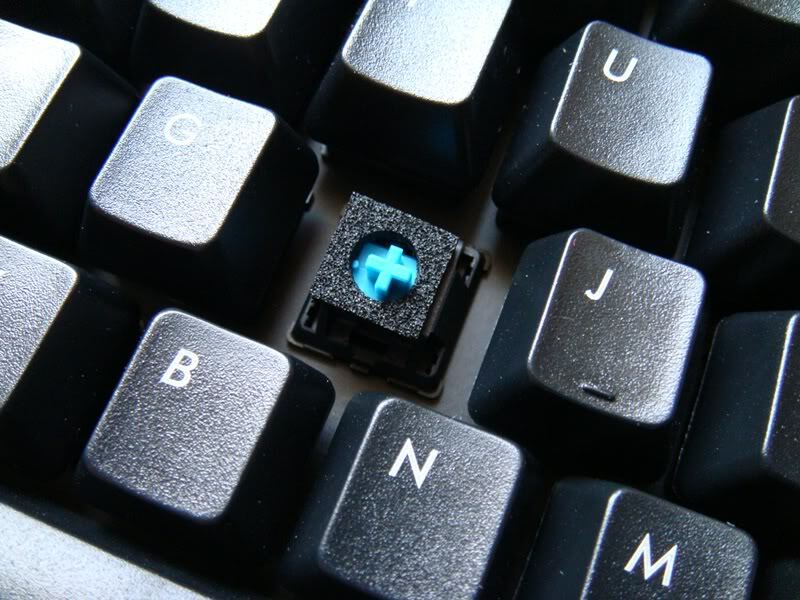 The effect will be the same, the foam catches the “clack” between the keycap stem and switch. Also, the travel distance is shorter, depending on the thickness. Just watch out you can only use them with Cherry MX or similar type of switches. Source: Geekhack, user Reaper. Installed soft landing pads. The feel, however, is different from o-rings. Elitekeyboard supplies the soft pads in a gray or black version, the latter being much stiffer similar to the 50A-R o-rings. Of course, you can easily make some DIY soft pads. If you’re more a neat type of person, then you might consider this clean solution from GMK electronic design, the QMX clip. Source: Massdrop GMK QMX drop. Basically, they’re identical to the soft pad solution but glorified with a bracket you can click on the switch. Neat right? The guy(s) from Keychatter.com made a nice sound sample video of it. So now that we’ve addressed immediate solutions to reduce the noise produced by the keyboard, there are also some external factors. Hold your breath, it’s your table. If you’re using a wooden or glass table, it will definitely influence the noise produced by the keyboard as it resonates all the key presses. An immediate fix for this is using a desk/mousepad or placing a towel underneath the keyboard or anything that can absorb vibrations. Personally, I would just recommend buying a Topre switch keyboard, they are already much more silent thanks to its rubber attribute. But I’m extremely biased at the moment. Well, as in, you know how to get around silently and not to disturb anybody in your surrounding. All the dampen methods might help reduce noise by 10 dB, but it will never be unnoticeable and it shouldn’t. Every keyboard will have its particular sound and with a mechanical keyboard, the sound is specifically a satisfying feeling. You could also choose to make one of the upgrades to change the feeling of the keyboard, by shortening the distance. You’re welcome to share any tips, tricks or your opinion. MOD EDIT: No advertising or self-promoting allowed without approval. Worth to note that the GMK clips can only be applied to PCB-mounted switches. I am looking for a way to stop the metallic backplate in a keyboard from resonating, so it will not produce the “ping”-noise that many keyboards are known for. Do you have a method for that? The ping comes from the springs inside the switch. There’s way to shorten the length of the ping sound by adding a sheet of light foam under the PCBA to shorten the amount it resonates. When you do a spring swap, always double check before installing it back in again. A big negative about spring swapping is that you need to de-solder it. There are some ways to swap it without de-solder with a PCB mounted switch. Just putting the idea out there. Saw this blog and instantly went to the fast and convenient route. I went to Lowes and Home Depot and took all their O rings that fit. To be honest it works. You won’t hear the biggest impacts until you have a majority of the switches with the rings. The click sound from every switch will bounce around to the other keys surrounding the key you pressed. In total i spent $25 to fully cover 60 keys (for an 87 switch keyboard. this will cover all the keys except, F1-f12, print screen, scrlk, pause, insert, home, pgup, pgdown, delete and end) getting faucet o-rings. It is cheaper for your mileage to buy the 120 ct. bulk bags as shown here. All in all, I have cherry mx blue clones. The clicks have been dampening turning a blue closer to something between a soft red and a hard brown sound.